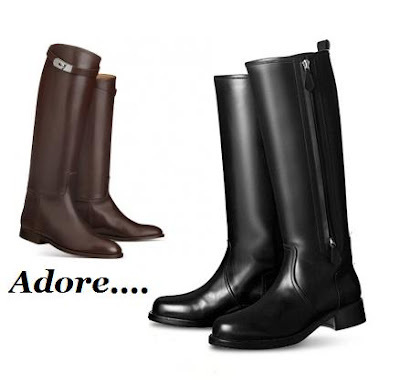 Isn't this just the most annoying when boots of my dream are actually by Hermes. Sigh.... what happened to savvy price??? When it comes to classic styling, Hermes sure is leading the pack. Perhaps that is when this pair of black classic Hermes boots have my heart beating faster. I can totally see myself loving this style for years and years to come. 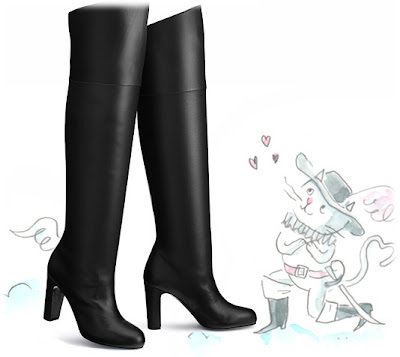 Initially I thought the black pair will cost $2-3K but the Hermes Land turns out to be $1200, which is very high but similar to some of other tall boots. If that is the case, this pair should be one of the consideration. I know Shoe Fairy won't be helping with these because hell will freeze over before this pair go on sale uh..... What do you think of Hermes Land?? If I am ever looking for boots with heels then this pair will be perfect. Hermes Defile is also $2150, ouch!!! I totally understand! I love Hermes EVERYTHING! Wow I can't believe how expensive they are!! absolutely beautiful boots... horrible price! ha! Oh my.. Hermes has done some incredible boots for this season.